Buddha Shakyamuni, or Gautama Buddha (c. 6th Century BCE), is the fourth of the thousand Buddhas that will appear in this world during this Fortunate Era. As a Supreme Emanation Body, He presented the Sutra Teachings of both the Foundation and Great Vehicles. Appearing in the aspect of Buddha Vajradhara, He revealed the Vajrayana teachings. The lineage of these teachings was then passed from Teacher to disciple, and spread first within India, then throughout much of Asia, and now to countries throughout most of the western world. Buddha’s teachings, or Dharma, are likened to a wheel that moves from country to country in accordance with changing conditions and people’s inclinations. The external forms of presenting Buddhism may change as it meets with different cultures and societies, but its essential authenticity is ensured through the continuation of an unbroken lineage of realized practitioners. Initially, there were two principal lineages passed down from Buddha Shakyamuni, known as the wisdom lineage of Nagarjuna and the method lineage of Asanga. The wisdom lineage of the profound path, which emphasizes the teachings on the nature of ultimate reality, passed from Buddha Shakyamuni to Manjushri, from Manjushri to Nagarjuna, and then to other Indian Buddhist Masters. The method lineage of the vast path, which emphasizes the activity of supreme compassion, passed from Buddha Shakyamuni to Maitreya, from Maitreya to Asanga, and then to Vasubandhu and other Indian Buddhist Masters. The Great Middle Way (maha madhyamaka) teaching is based on the union of the Profound View and Vast Conduct lineages of the SuperioirsNagarjuna and Asanga, neither overestimating nor denigrating either, and is therefore called the ‘Definitive Meaning’. Practitioners of the Great Middle Way are known as Jonangpas. The great Jonang Teachers, the Jonang Khenpos, are famous not only for being great scholars but also for being spiritual practitioners of immense purity and sincerity. By integrating their knowledge of the Buddha’s teachings into their practice of Lam Rim (Stages of the Path, as presented by Jetsun Taranatha in His Essence of Ambrosia), and by applying this wisdom in their everyday life, Great Middle Way Buddhists are encouraged to transform all activities into the path to enlightenment. Whereas some Buddhist schools give ‘provisional’ status to the First, Second, or Third turnings of the Wheel of Dharma, Kunchen Dolpopa established that the Definitive Meaning can be found in all three if one applies the correct method of analysis and relies on the direct perception of meditative absorption. While the Tathagata sutras are certainly embraced (especially the Uttaratantra) by Jonangpas, so are all the Teachings of the Buddha, without exception. The Great Middle Way was taught by the Buddha, elaborated in India, and later transmitted in Tibet. Among the early Tibetan authors on the Great Middle Way was Yumo Mikyo Dorje, an 11th century Kalachakra yogi. He was a disciple of Somanatha, the Sanskrit Pandit and Kalachakra master from Kashmir who translated the Vimalaprabha —the great Kalachakra commentary— into Tibetan with Dro Lotsawa. Yumo Mikyo Dorje received the Great Middle Way teachings while practicing the Kalachakra Sixfold Vajra Yoga in the Mt. Kailash area of Western Tibet. In 1294, Kunpang Tukje Tsondru (1243-1313) founded a monastery in Jomonang, which gave the name to the Jonang lineage. This monastery was modeled on the traditional design of the Kingdom of Shambhala. Tukje Tsondru also arranged and gathered the Sixfold Vajra Yoga (jor druk) practice traditions that existed in Tibet at that time. The Omniscient Dolpopa Sherab Gyaltsen (1292-1361) settled in Jomonang after studying each of the existing Buddhist traditions in Tibet, including the Kagyu, Nyingma, and Sakya (in which He was ordained). Kunchen Dolpopa served as abbot of Jonang Monastery, and in the year 1333 completed the Great Stupa of Jonang. Kunchen Dolpopa was the first Jonang master to extensively teach Zhentong, the view of Other Emptiness. In his most famous work, Mountain Dharma: Ocean of Definitive Meaning, Kunchen Dolpopa clarified the Zhentong view. These are referred to as the Teachings of the Heart’s Essence (snying po’i don). The Jonang produced a number of renowned Buddhist scholars. Among these was Jetsun Taranatha (1575-1634), who founded Takten Phuntsok Ling Monastery. He is widely known as one of the greatest scholars, historians, and practitioners of his time. Two of Jetsun Taranatha’s best known works are his History of Buddhism in India and Origins of the Tara Tantra. In the mid 17th century, the Jonang came under attack by the politically powerful Gelukpas, under the rule of the 5th Dalai Lama. The Gelukpa declared the Zhentong view of other-emptiness to be ‘heretical’, sealed Jonang libraries, burned Jonang books, and forcibly closed or annexed Jonang monasteries. Following this repression, it was generally believed that the Jonang tradition had become extinct. However, as many as seventy Jonang monasteries are still active in isolated areas of Tibet and China. Today, Dzamthang Tsangwa Monastery in Amdo is home to approximately 1,500 monks, and there are more than 5,000 Jonang monastics in this remote region of Tibet. There are also Jonang practice centers in China, Taiwan, Nepal, and the USA. As a gesture of goodwill, His Holiness the 14th Dalai Lama gifted the Jonang their first monastery in exile in Shimla, Northern India. 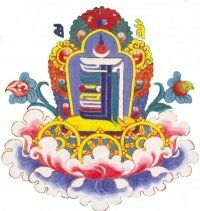 For the initial 300 years of the Jonangpa, the primary lineage-heir was the master who held the seat of Jomonang, and later of Jetsun Taranatha’s Takten Damcho Ling Monastery (Phuntsok Ling). In the mid-17th century, when the Jonangpa began to settle in the Amdo region of Northeastern Tibet, Dzamthang Tsangwa Monastery was founded by one of Taranatha’s disciples, Lodro Namgyal. Since that time, the spiritual authority of the Jonang has never rested on any one individual. In obedience to our Teacher, Kyabje Tashi Norbu Rinpoche, we have chosen to remain faithful to the original Jonang practice of avoiding official designations of leadership, and allowing the quality and power of the Dharma activities of each Teacher and Sangha to manifest unimpeded. Hi, Tashi-la. I have been admiring your wonderful blog site for some time now. It is a pleasure to see your posts and I rejoice in your efforts to bring dharma to those who seek it. I wanted to thank you for all your guidance and inspiration in encouraging me to investigate pramana and other-emptiness. Recently, I have dedicated my focus on practice, study of more basic buddhadharma, and have recently returned to university again to make a career change. As a result, I have not been quite as active in the electronic communities lately. I have procured a copy of Jetsun Taranantha’s ‘The Essence of Other Emptiness’ per your suggestion and look forward to reading it. Did you want to subscribe? If so, there is a space for that on the right hand column of the blog. Gracias again, Venerable Tashi-la!… I guess this will be a page to study carefully, and one i will be visiting repeatedly. You give me a guideline i had never found before in my far-away, lay, poor and little Spanish-speaking country. Gracias profundas y constantes, Maestro. Our mutual friend Ken Castro referred me to your blog a while ago. Very nice outline of another Middle Way. I’ve recently returned from a 1-week pilgrimage to Bhutan to deepen my understanding of Tibetan Buddhism (Kalachakra in particular). Also interested in Agni Yoga. Thank you for your quite informative blog.